Edward Said leaves us with the impression that all prejudice is only on the part of the West. To the traditionally minded, news of such things as man-made laws based on objective evidence, free speech, equal justice under law, democracy, elections, freedom for women, freedom of religion and respect for the "other," and so on, may have come as a sort of horror. Despots recoiled from the very thought of democracy. Religious leaders fumed at secular education, the freedom to question and say what one liked, even about religion. "It is the nature of Islam to dominate, not to be dominated; to impose its law on all nations and to extend its power to the entire planet." — Hasan al-Banna', Founder of the Muslim Brotherhood, 1928. The vast amount of what is called "Islamophobia," however, is not that at all. Fair criticism is not phobic, responses to Islamic terrorism are reasonable reactions to violence. Based on news reports of Muslims murdering other Muslims and killing Christians, there is, ironically, probably more Islamophobia among Muslims for each other than there is from Westerners toward Muslims. There is also probably more "Infidelophobia" by Muslims toward non-Muslims than by non-Muslims toward Muslims. Again this year, the Organization of Islamic Cooperation held a conference calling for a universal blasphemy law -- legislation it has repeatedly tried to pass for over a decade, with the help of U.S, Secretary of State Hillary Clinton. The aim is not to protect other religions (about which Muslims blaspheme without cessation), but to block any criticism of Islam. Sometimes it seems as if Islam ceases to be treated as just another religion and becomes a religion intolerant of all others and unduly protective of its own rights and privileges. In democratic states, Islam is evidently already the only religion that may not be criticized, even though criticism of religion has for centuries been a cornerstone of free speech and transparency that are essential elements in democracy. These freedoms really matter, yet not one Muslim country can claim to implement or protect them, especially freedom of religion. On July 9th, the European Commission against Racism and Intolerance, within the Council of Europe, published its annual report for 2014. The report identifies a dramatic increase in antisemitism, Islamophobia, online hate speech and xenophobic political discourse as main trends in 2014. It also indicates that "Islamophobia is reported in many countries, counteracting integration efforts for inclusive European societies. According to the report the rise of extremism and in violent Islamist movements has been manipulated by populist politicians to portray Muslims in general as unable or unwilling to integrate and therefore as a security threat." This is, of course, troubling, and it is right for the Commission to treat it as a growing problem. But just how widespread is the issue, and to what extent is it readily identifiable? Some claims of Islamophobia have their roots in the perception of increasing Muslim violence within Europe; some are based on existing racist attitudes, and some are derived from Muslim perceptions of victimhood and charged sensitivities. The latter is the main reason why defining Islamophobia is not as simple as describing anti-Semitism, anti-immigrant prejudice, or anti-black racism. To understand this more clearly, it is necessary to slip back briefly to the past. In 1978, Palestinian-American professor Edward Said (1935-2003) published a book, Orientalism, which changed the way many people thought about the Middle East and Islam. Said's book, deeply flawed, nevertheless became a bestseller translated into thirty-six languages. Those of us who were the first to read it  teachers and students in Islamic and Middle East Studies  were taken in by its façade of intellectual impartiality and the sense we all had that it opened our eyes to our own work in an original way. It was, to use Thomas Kuhn's celebrated phrase, a paradigm shift that changed our understanding of our researches and the meaning they had, for we were precisely the 'orientalists' Said so tartly scolded. Some of moved away in later years, but many are still mesmerized by that smooth prose and challenging flair. It wasn't long before Said's appeal moved into other disciplines and to other regions far from the Middle East. Orientalism even laid the foundations for a new item on the academic curriculum: "Post-colonial Studies." The subject, now taught in universities in many countries, has produced a vast literature, has its own academic journals and numerous associations and institutes. Said, like Franz Fanon, Gayatri Spivak, Derek Gregory and others, remains a core figure, and Orientalism a central text. According to Said, Westerners, by virtue of not being Muslims, have always falsified and distorted their writings about Islam and Muslims. Said claimed to see deeply-ingrained prejudice in the works of French, British, Russian and other Orientalist scholars and writers. To him, Orientalism was (and is) a tool of the colonial powers, assisting their mission supposedly to administer and subdue the peoples of the East. Since former colonies have achieved independence, he contends that the former imperialists still exert pressure on the ex-colonies in order to control them. Israel is regarded by most Marxists, socialists, and even many liberals as an entity created to colonize the Arab Middle East and is often condemned, even by people who are supposedly educated and should know better, in abrasive terms as a malign extension of the West. Perhaps the best-known sentence in Said's book is: "[S]ince the time of Homer every European, in what he could say about the Orient, was a racist, an imperialist, and almost totally ethnocentric." As Bernard Lewis has been heard to remark, "If that were true, the only reports of marine biology would have to be by fish." But for Said and his followers, the world is divided between Western guilt and Eastern victimhood. What is missing from Said's work is any attempt to deal with the long history of Islamic empires,[a] the conquest of, and permanent rule over, non-Muslim states and peoples, and the often distorted ways in which Muslim writers have sought to interpret and explain Christian, Jewish, Hindu and other worlds. Said leaves us with the impression that all prejudice is only on the part of the West. Despite his bias, distortion of facts, and openly documented deceptions, many of Said's followers, who are unwilling or unable to do their own work, see him as an intellectual to students and teachers who adhere to an anti-establishment, anti-Western, and socialist world view. For many, his book, Orientalism played a role in delegitimizing the West and furthering causes such as multiculturalism or anti-Zionism. In the meantime, however, not surprisingly, the book's influence spread, into the Islamic world and the smaller world of Muslim communities in the West. Better-educated Muslims read and digested Said's message, in a manner rather different from Western readers, many or most of whom were atheists and agnostics. For Muslim readers, Said's message that the West was hostile to Islam became the first strong antidote to their sense of failure. Muslims saw themselves as backward but now believed they were the victims of a Western conspiracy to deny them the fruits of their great civilization. To disparage the West became, for many, a religious imperative. For religious Muslims, it was becoming increasingly important to deal with the stresses caused by their economic, political, and military subordination to a flourishing West, coupled with their own lack of progress in the non-Muslim world and at home. The repeated defeat of multinational Arab armies by the "despicable" Jews of Israel stood, and for millions of Muslims still stands, as a symbol of their need to reassert themselves on the world stage -- as Iran is trying to do today. For many Muslim immigrants, adjusting to their new environment is difficult, possibly even more than for other newcomers to the West, from Africa, say, or India. Their religious leaders often tell them that Muslims are superior to all unbelievers. [c] Their history tells them a story of almost uninterrupted conquest, when bands of early Muslims came out of the deserts of Arabia to fight and destroy the two great empires of the day, the Byzantines and the Iranian Sasanids. The same history tells Muslims how Islam spread to the ends of the known world and how for centuries Islamic civilization was superior to all others. But with the re-emergence of Europe and the gradual subjection of the Muslim world to "infidel" powers, much of that sense of superiority evaporated. From the late nineteenth century, Muslim reformers repeatedly called for a revival of Muslim thought and practice. Renewal (tajdid) was, for more secularist rulers such as the founder of modern Turkey, Mustafa Kemal Atatürk (1881-1938), to be achieved by a process of secularization. But for religious thinkers such as Rashid Rida, it meant a revival of the faith as a reaction to the achievements and power of the West, and a reassertion of Islamic superiority. This cultural collision might well have been difficult for some Muslims to take in. After all, had God not promised them victory, not just for a time, but until the entire world was conquered for the faith? And had God not fulfilled his promise? Conquest had followed conquest, empire had succeeded empire, and on the back of these advances, a great civilization had come into being, with all its variants across the globe. For centuries, Muslims, many uninformed about what the changes in Europe, had, as Lewis argues, indulged a sense of political and religious supremacy. And for centuries they appeared justified in this belief. But things changed, and not for the better. In 1798, Napoleon conquered Egypt, with ease. Even though his forces remained only a short time, that conquest was the first chink in the armor of Islam. During the nineteenth and twentieth centuries, the British and French occupied and colonized much of the Middle East and Africa. Having been the undisputed masters of their realm for so long, and having ruled so effortlessly over the Jews and Christians who lived among them as second-class citizens, Muslims had grown complacent. If it was irksome to become subordinate to non-believers, worse was to follow. The West did not just possess superior military might; it soon became clear that Westerners were far from the infidels of popular imagination. Several countries  Turkey and Iran, notably, which never became fully colonized  started to send students and diplomats to European countries, chiefly Britain and France. In Europe these travellers were introduced to ways that may have made the West seem superior: parliaments, constitutions, man-made laws based on objective evidence, universities with academic freedom, free speech, equal justice under law, democracy, elections, high-quality schools, a general lack of corruption in public affairs and commerce, growing freedoms for women, freedom of religion and respect for the "other," and so on. To the traditionally minded, news of such things may have come as a sort of horror. Despots recoiled from the very thought of democracy. Religious leaders fumed at secular education, rights for women, the freedom to question and to say what one liked, even about religion. But younger, modernizing minds were released from the shackles of the past. From the late nineteenth century, pressure for secular reform began to appear, and for a time it seemed as if important events lay on the horizon. The Young Turks in the Ottoman Empire and the reformist anti-clerical movement in Iran seemed to usher in better times and freer lives. But despite this apparent Muslim Spring and the appetite for reform it inspired, the doors to change quickly slammed down again throughout most of the Islamic world. In Iran, the secularizing but brutal Pahlavi dynasty provoked the Iranian Revolution of 1979, led by the Ayatollah Khomeini. Out of that, as the Islamists sought to quell dissent and impose their own theocratic rule, emerged Iran's current totalitarian and theocratic regime. This response leads directly to the holy war currently being waged against the West (including Israel) by radical Muslims, through organizations such as al-Qaeda, the Taliban, Islamic Jihad, Hezbollah, Hamas, and, even more brutally, the Islamic State (Da'ish). A second response, devoid of the tactic of violence, was to seek to reform Islam itself from within. These reformers, (such as Muhammad 'Abduh or Rashid Reza), were Salafis who aimed, not at the modernization of Islam, but in the other direction: at its return to the values, mores and practices of seventh-century Arabia -- the time when Muslims lived with, and were guided by, Muhammad and the first three generations of his followers. Their aim is bold: to purify Muslims of the accretions their religion has taken on down through the centuries. There is an old Islamic juristic principle: innovation (bid'a) is heresy, and leads to hellfire. Valiant as this response may seem to be, it has clearly been unable to stem the tide of rapidly expanding modernity. What it did achieve, even while affording them access to the latest technology, was to drag Muslims backwards. While science and technology have left a powerful mark on Muslim societies (best summed up in Iran's nuclear program), they are often deployed within a context of old-fashioned religious beliefs that are not innovative in any way. Thus, for example, before and during the Islamic Revolution in Iran (1978-79), cassette tapes were used to powerful effect by the revolutionaries. And today, even the most backward-thinking Islamist groups all advance their cause for a return to basics through the internet and the use of social media. A third tactic has been to place the blame on the West for each and every misfortune that assails the Islamic world. This applies, not just to military interventions such as Iraq or Afghanistan, but to economic failure; a fall in oil prices; the "immorality" of young people; the conversion of Muslims to Christianity, atheism, or anything that is not Islam; women's rights; the creation and perpetuation of Israel; young people questioning their parents and other free speech; the failure of Muslim immigrants to Europe to flourish, and whatever else takes one's fancy. The psychological truth behind all this is plain to see: It is a form of Freudian projection: taking the qualities about oneself that one does not like and projecting them onto others. This defense against an affront to our good opinion of ourselves can also be one of many forms of denial, whereby someone with problems denies he has any and instead happily pins the blame for whatever goes wrong in his life on others. For many Muslims  as for all of us  responses such as these play a particularly important role in making sense of what seems a hostile world. If Muslims thought that Islam itself had failed, that God's promise of eventual triumph across the earth had been left unfulfilled (or worse, that it was hollow in the first place), then the psychological ramifications could be shattering. For conservative Muslims, the greatest catastrophe would be if, as a result of Westernization, millions in the Islamic world would lose their faith. Societies, held together by mutual belief would fall apart. Better by far to blame outsiders. And, even better, to find that the outsiders responsible for all our woes have all the time been the Jews and Christians whom Scripture instructs Muslims to despise for plots against the true faith. Out of this tortuous medley comes what some call "Islamophobia." It is evidently not enough to cite Westerners as the agents of Islamic decline. They must, according to that view have a motive, and this Western motive is supposedly uncovered in an active hatred of Islam. It is a hatred, the claim seems to go, born of a jealousy already there at the time of the Prophet, when the Jews, they allege, "conspired" against him. This hatred was supposedly there again in the Crusades, when the Christian Church sought to dislodge Islam from its commanding heights around the Levant and beyond; and also during the colonial and post-colonial periods, not just abroad but also at home, within the borders of Islam itself, as in Morocco, Algeria, Libya, Egypt, India, Mali and elsewhere in Africa, and in Indonesia, Malaya, the Philppines, and Central Asia. Although the term "Islamophobia" may go back as far as 1916 in French, and seems to have been introduced to English by Edward Said himself in 1985, its use has grown rapidly in the UK and the United States. Today, it is employed in vague and sloppy ways, often conflated with claims of a victimhood similar to racism. The vast amount of what is called "Islamophobia," however, is not that at all. Fair criticism is not phobic; responses to Islamic terrorism are reasonable reactions to violence just as we react against all other forms of terrorism. If you read Muslim or pro-Muslim accounts of Islamophobia, they find fault with just about everything that implies a negative view of something Islamic, whether texts, history, or customary practices. Curiously, the same people who complain about Islamophobia seem never to complain about Muslim anti-Semitism or hatred for homosexuals or other violations of human rights. In that sense, many have constructed a hate crime that only exists sporadically, within small groups like the UK's fading English Defense League or in comment pages remarks by individuals, few of whom seem well- educated or polite. The Council for American-Islamic Relations (CAIR), for instance, has a website called Islamophobia.org, but the offenses do not seem nearly as ubiquitous or as hateful as Muslims claim, and often seem to have occurred as a reaction to some kind of "Infidelophobia." Based on news reports of Muslims murdering other Muslims and killing Christians, there is, ironically, probably more Islamophobia among Muslims toward each other than there is from Westerners toward Muslims. There is also probably more "Infidelophobia" by Muslims toward non-Muslims than by non-Muslims toward Muslims. What true Islamophobia exists does so only on the margins of Western society. It reveals itself in the racist protests of the English Defence League; in the Reverend Terry Jones calling his book Islam is of the Devil and his threats to burn the Qur'an; and in comments on some anti-Islamic websites. Fair criticism is not phobic; responses to Islamic terrorism are reasonable reactions to violence just as we react against all other forms of terrorism. What true Islamophobia exists does so only on the margins of Western society. 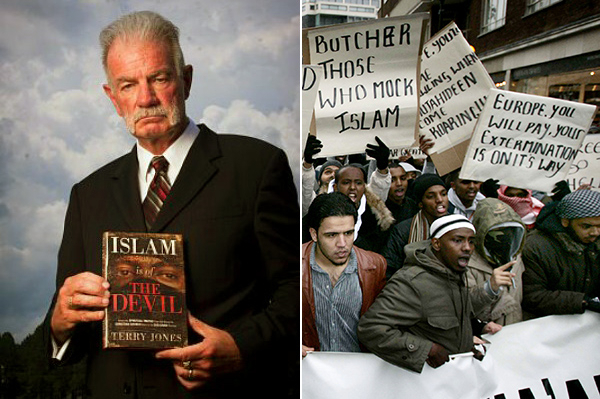 It reveals itself in the Reverend Terry Jones calling his book Islam is of the Devil and his threats to burn the Qur'an. For all that, some haters make themselves quite visible; even so, they represent only a small number of the public, most of whom do not even know they exist. Most people are simply critical of what they see daily about Islam: violent acts across the globe, threats against freedom and democracy, hatred preached in mosques and Islamic centers  all justified as matters ordained by the Islamic faith. Others are disturbed by the negative impact of Muslim immigration on Western societies. In America, the destruction of the twin towers and the attacks on the Pentagon on 9/11 were calculated to bring to the surface growing fears about the harm that growing Muslim radicalism could cause. The accusation of Islamophobia has come to be a knee-jerk reaction to any, even wrongly-perceived, criticism of Islam. For centuries, Muslims have guarded their customs and their religion from criticism, and this has led to severe problems: a lack of safe arenas in both the Muslim world and within Muslim communities in the West, where Muslims may analyse and debate religious issues without fear of severe retribution for stepping across lines, such as declarations that intellect and logic are unIslamic; the prohibition of free speech, the use of murder to silence anyone who steps too far out of line, dissidents or apostates for instance. No healthy society can survive with such restrictions. The West has thrived on its citizens' freedom to challenge received ideas, to speak openly in debate, and to criticize without fear of reprisal. Accusations of Islamophobia are bandied about by Muslim organizations in Europe and North America, such as the Muslim Council of Britain (MCB) or the Council on American Islamic Relations (CAIR). Some of their concerns are genuine. Physical attacks on Muslims just because they are Muslims are totally unacceptable in any civilized society. On the other hand, it often appears as if any questioning of Islam or Muslims, however minor, is inflated and rebutted by a charge of Islamophobia. Sometimes such questions are interpreted as criticism, and lead to the suppression of free debate and an exchange of ideas. It then seems as if Islam is no longer treated as just another religion and becomes a religion intolerant of all others and unduly protective of, and assertive of, its own rights and privileges. Islamophobia also sometimes seems conflated with blasphemy. Almost any statement or act deemed disrespectful of Islam, when uttered or committed by a non-Muslim, may be counted by some as a form of hatred for Islam itself, and regarded as subject to punishment or, as we have seen recently, murder and attempted murder. In February, American-Bangladeshi secularist Avijit Roy was hacked to death in Dhaka, as were Washiqur Rahman in March, Anantaa Bijoy Das in May, and Niloy Neel on August 6. In France, the editors of a magazine, Charlie Hebdo, and the organizers of a Draw Muhammad exhibition in Garland Texas. Incidents such as those occurred apart from the unprovoked murder of Jews outside a religious school in Toulouse France, and in a kosher French grocery store. In the West, blasphemy is no longer considered a crime worth rebuke, let alone capital punishment, even if many Christians or Jews deplore it as a mortal sin. Freedom of speech has become so vital to the functioning of a healthy, open society that even gross disrespect as shown in Andres Serrano's controversial photograph, "Piss Christ", though often protested, may be placed on public display without legal opposition. For some Muslims, however, there appears to be a heightened sensitivity over anything that seems scandalous to the religious eye. On November 25 2007, for example, Sudanese mobs called for an English teacher, Gillian Gibbons, at a British school in Khartoum to be put to death because the young children in her classroom had decided to name their teddy-bear the popular name, Muhammad. She was reported for blasphemy and charged under the Sudanese Criminal Act with "insulting religion." On 30 November approximately 10,000 protesters took to the streets in Khartoum some of them waving swords and machetes, demanding Gibbons's execution after imams denounced her during Friday prayers. During the march, chants of "Shame, shame on the UK", "No tolerance  execution" and "Kill her, kill her by firing squad" were heard. In this extreme case, Muslims around the world, including the Muslim Council of Britain, protested. Ms. Gibbons was granted a presidential pardon and returned to Britain. Had she not been a British teacher, her fate might not have had the same fortunate outcome. None of those who called for her death was brought to book for any breach of human rights. More serious cases have included the Satanic Verses affair; the Danish cartoons controversy; the 2004 murder of the Dutch film-maker, Theo van Gogh, the 2007 controversy over a sketch by Swedish cartoonist Lars Vilks; or the attempted murders of the cartoonist Kurt Westergaard, or Lars Vilks; and the recent court cases against the Dutch MP, Geert Wilders. But there have been dozens of other cases, many of which have ended in imprisonment, flogging, and, on several occasions, murder. It makes little difference if the "blasphemer" is a non-Muslim or a Muslim, a journalist or an academic. Any perceived show of disrespect for Islam, the Prophet, the Qur'an or Muslim customs and beliefs contravenes a long-established principle that Jews and Christians living under Muslim rule must always act in a spirit of humility towards Muslims and Islam. Invoking blasphemy against non-Muslims who live beyond the realm of Islam, in countries not under Islamic rule, is supposed to be outside the original scope of Islamic law. Nevertheless these also now seem to be areas open to charges of Islamophobia. More troubling is that several European countries have been suborned by Muslim protests to bring their own citizens to court on charges of insulting Islam for their books, films, or speeches. In Austria, Elisabeth Sabaditsch-Wolff has stood trial for her remarks about Islam; Geert Wilders and Gregorius Nekschot have been tried in the Netherlands, and Wilders is now being charged by Austria; in 2002 Michel Houellebecq was charged in Paris for having called Islam stupid; in 2010, Queensland's Anti-Discrimination Commission condemned Michael Smith for having criticized the burka, and forced him to go for "mediation" with one Omar Hassan, the Muslim who had complained about him. More recently, Lars Hedegaard, head of the Danish Free Press Society, was put on trial on similar charges. Mark Steyn and Ezra Levant in Canada were taken to task for their remarks about Islam. Islamophobia is now a crime determined as much by Western courts and tribunals as by Muslims. As this trend grows in democratic states, Islam is, apparently, the only religion that may not be criticized, even though criticism of religion has for three centuries been a cornerstone of free speech and transparency that are essential elements in democracy and the rule of reason through open-minded, deductive processes. Many of these accusations of blasphemy may seem trivial to the Western observer. A teddy bear, some cartoons, an article about the role of women in Islam that led to a 20-year sentence for Afghan journalist Parwiz Kambakhsh (the sentence was originally death) or the inadvertent touching by a Christian teacher of a bag that may have held a copy of the Qur'an. This last is a particularly gruesome story in which something totally trivial unleashed mob violence and resulted in the violent death of a young Christian woman, Christianah Oluwatoyin Oluwasesin, at the government school where she taught in Gombe, Nigeria. In Pakistan, last November, a young Christian couple, Shama Bibi and Sajjad Masih were burned alive in a brick kiln for the alleged desecration of a Qur'an. This year, Saudi blogger Raif Badawi was sentenced to 1000 lashes and ten years' imprisonment for "insulting Islam." Asia Bibi, a Pakistani Christian woman arrested in 2009 on a spurious charge of blasphemy remains in prison in poor health, beaten by the guards charged with protecting her under a sentence of death. For many Muslims, however, these are not trivial occurrences at all. In a case in Malaysia in 2009, a ruling was made that non-Muslims might not use the word "Allah" to refer to God. The decree was upheld in a 2015 ruling by the country's Supreme Court. The argument against the use of Allah was not frivolous. The government's religious advisor, Abdullah Muhammad Zin, argued that as Christians, for example, believed in the Trinity; that Jesus was the Son of God; that God had died on the cross, and so on, it would represent a huge blasphemy to the one, indivisible and true Muslim God. There were arguments  and many Muslims made them at the time  that the ban was somewhat ridiculous: Arab Christians use "Allah" as a matter of course, as in "insha'allah," [if God wills; hopefully]. It is clear, however, that that the motive for such a ruling was not frivolous in the way it certainly seems to Westerners, but a striking indication of the Islamic obsession with exerting power over non-believers even in what appear to Westerners to be minor things. It is in cases such as this that a genuine rift can be seen between the West and Islam. The situation has been significantly blurred by political correctness from Western multiculturalists and those Muslims who adopt their tactics to argue that all cultures are equal and that any non-Muslim criticism of Islam is Islamophobic. Such blurring misses the point. One of the most precious things for Westerners is freedom, hence our emphasis on human rights -- which can only be guaranteed in free, open societies -- and where the exercise of rights depends entirely on the preservation of freedom. Thus, free speech; freedom to criticize; freedom of the press; religious rights (above all, the rights to apostasize, convert or choose no religion); separation of church and state; political freedom, and freedom from arbitrary application of the law. These freedoms really matter, yet not one Muslim country can claim to implement or protect them, especially freedom of religion. For Muslims, liberty of conscience and action, even within the constraints of the law, is anathema. A Muslim is, quite literally, one who submits, just as "Islam" means, literally, "submission." Whether this means submission to God or to the Islamic state or to the clerics who define what is, and what is not, Islamic, the result is individual submission, voluntary or coerced, to the laws of the shari'a, the body of ordinances that constitute the totality of what a Muslim must believe and how he or she should act. Freedom does not enter into it. A man is not at liberty to pray or not as he sees fit: the law says he must pray five times a day, and he must be punished if he does not. Enforcement of this law reached its most explicit form when a Somali cleric decreed that anyone who did not pray five times a day must be beheaded. That is far from typical, but it does show how easily a simple matter of dereliction may be transformed into a major criminal offence. Here is where the enforcement of shari'a law, taking offence at blasphemy, and fear of Islamophobia come together. For a Muslim to utter something blasphemous, or to do something that infringes the dignity of the faith, leads directly to criminality or, in many jurisdictions, to apostasy. And the penalty for apostasy is, for the most part, death. The reason for this seems to be that Islam is rooted in a dichotomy. [f] In the Qur'an, the world is depicted in stark black-and-white terms. There are the People of the Right Hand and the People of the Left hand. The former, who are Muslims, are the People of Paradise; the others, non-Muslims, are the People of Hellfire. There is belief and unbelief; there is no grey area between. There is Islam and there is all that is not Islam; all things are measured by this reckoning. In the classical Islamic formulation, the entire world is divided between Dar al-Islam, (the Realm of Submission) and Dar al-Harb, (the Realm of War.) Thus, these twin realms co-exist in a state of potential or actual war, not just ideologically but also militarily. From this perspective, the modern Western world presents an unwanted challenge to the realm of Islam. At present, the West cannot be conquered, although many extremists, such as the fighters who serve with ISIS, believe that conquest is exactly what will happen in the end. Such a victory would embody the triumph of belief over unbelief, as it did in past centuries, when Muslims ruled most of the known world -- but at a horrendous cost for mankind. Worse still, Muslims living in the West are thought by conservative Muslims to be at risk of apostasy, seduced as they might be by the allurements, physical and intellectual, of non-Islam. Behind the face of apostasy, Islamists proclaim, lies the grinning skull of Satanic lures of debauchery set for the unwary. Freedom to change one's religion, a core feature of the Universal Declaration of Human Rights, fills the traditionalist Muslim heart with horror; it portends the possibility that the realm of Islam may end up as nothing more than another province in the empire of non-Islam. The absence of Islam does not necessarily threaten most religions: a healthy secular society, for instance  of which Israel is one of the best examples  tolerates and supports highly religious people, lightens the tax burden on churches, synagogues and temples, protects holy places, supports religious schools, and so forth. But Islam in its full sense cannot exist outside the political and legal realms because it is not merely a religion but a system of government and law. For Islamists, their religion must govern, control, and legislate. If Muslims abdicate those responsibilities, they might as well be considered apostates. Doubtless Islamophobia exists, just as anti-Semitism and anti-Christianity exist -- and it should be resisted. But it is neither as widespread nor as penetrating as it is so often proclaimed to be. Moreover, the idea that the "problem lies not with Islam, nor even with some of the Muslims but with the environment Muslims are currently in" has no legs, since Sikhs and numerous other migrant communities are in equal if not lower socio-economic and political conditions than Muslims all over the world but without the radicalisation and terrorism prevalent in their communities. This tendency amongst the Muslim community leaders to remain in denial about the problem with religion is what is driving the identity crisis which is leading to radicalisation among Muslim youth. Why is it so hard to accept that there is in fact a problem with Islam  the way it is being used? Its real meaning is not so much active hostility on the part of Westerners as a need for many Muslims to assert their identity in the face of a world made up of unbelief, and the concomitant resistance to coercive expressions of it. [c] See, for example, the statement by Fautmeh Ardati of Hizbut Tahrir, when she speaks of 'the superiority of Islamic values over Western values'. Cited in Savage Infidel, 20 September 2010. See also Shaykh Salih al-Munajjid, Superiority of Islam over Infidelity. [d] For a comprehensive study of this situation, see Bernard Lewis, What Went Wrong? Western Impact and Middle Eastern Response, London, 2002. It is also important to study the writings of three Egyptian exponents of Islamic revival, Rashid Rida (1865-1935), Hasan al-Banna' (1906-1949), the founder of the Muslim Brotherhood, and Sayyid Qutb (1906-1966), the Brotherhood's leading ideologue. Nor should we neglect the theories of Indo-Pakistani Islamist Abu A'la Mawdudi (1903-1979). [e] Cited Lawrence Wright, "The Looming Tower: Al-Qaeda and the Road to 9/11," Vintage Books (New York), 2007, page 29. [f] This characteristic of Islam was originally revealed in great detail in a magisterial study by M. M. Bravmann, The Spiritual Background of Early Islam. The relentless Jihad against Israel — against, rather, any Infidel sovereign state within the Dar al-Islam — always included imposition of the Shari'a as part of its intended goal. Imposition of the Shari'a was, in fact, demanded as early as 1920 by a group of Arab notables in the former Ottoman territories that were quite properly assigned to Mandatory Palestine (i.e. all of Western Palestine, while Eastern Palestine went to form part of the Emirate of Transjordan). Nor was there any doubt that the attempt to keep Jews out of the area was a Jihad directed at Infidels throughout the Mandatory period; curiously, it was some British officers, rather than the Palestinian Jews, who recognized the Islamic grounds for opposition to the Jews and the restoration of a Jewish Commonwealth. It is also true that a few Israelis, early in the history of the state, had the wit to recognize the problem. One of these was Dr. A. Carlebach, whose analysis published in Ma'ariv (Oct. 7, 1955) would have been lost to history, one suspects, but for the fact that it is reprinted, amusingly and quite uncomprehendingly, in Edward Said's preposterous "The Question of Palestine." Fortunately for us, Said often provided quotes from various European and Zionist sources that are so deadly, so convincing, particularly in the light of all we have learned about Islam over the past few years, that as works of propaganda they no longer serve their purpose. Here is what Said quoted from Carlebach, and what Said obviously thought it was self-evidently absurd, but we read it now with quite a different frame of mind: "These Arab Islamic countries do not suffer from poverty, or disease, or illiteracy, or exploitation; they only suffer from the worst of all plagues: Islam. Wherever Islamic psychology rules, there is the inevitable rule of despotism and criminal aggression. The danger lies in Islamic psychology, which cannot integrate itself into the world of efficiency and progress, that lives in a world of illusion, perturbed by attacks of inferiority complexes and megalomania, lost in dreams of the holy sword. The danger stems from the totalitarian conception of the world, the passion for murder deeply rooted in their blood, from the lack of logic, the easily inflamed brains, the boasting, and above all: the blasphemous disregard for all that is sacred to the civilized world...their reactions — to anything — have nothing to do with good sense. They are all emotion, unbalanced, instantaneous, senseless. It is always the lunatic that speaks from their throat. You can talk 'business' with everyone, and even with the devil. But not with Allah...This is what every grain in this country shouts. There were many great cultures here, and invaders of all kinds. All of them — even the Crusaders — left signs of culture and blossoming. But on the path of Islam, even the tries have died." We pile sin upon crime when we distort the picture and reduce the discussion to a conflict of border between Israel and her neighbors. First of all, it is not the truth. The heart of the conflict is not the question of the borders; it is the question of Muslim psychology.....Moreover, to present the problem as a conflict between two similar parts is to provide the Arabs with the weapon of a claim that is not theirs. If the discussion with them is truly a political one, then it can be seen from both sides. Then we appear as those who came to a country that was entirely Arab, and we conquered and implanted ourselves as an alien body among them, and we loaded them with refugees and constitute a military danger for them, etc. etc. ...one can justify this or that sideand such a presentation, sophisticated and political, of the problem is understandable for European mindsat our expense. The Arabs raise claims that make sense to the Western understanding of simple legal dispute But in reality, who knows better than us that such is not the source of their hostile stand? All those political and social concepts are never theirs. Occupation by force of arms, in their own eyes, in the eyes of Islam, is not all associated with injustice. To the contrary, it constitutes a certificate and demonstration of authentic ownership. The sorrow for the refugees, for the expropriated borders, has no room in their thinking Allah expelled, Allah will care. Never has a Muslim politician been moved by such things (unless, indeed, the catastrophe endangered his personal status). If there were no refugees and no conquest, they would oppose us just the same. Now when Said put this into his little work of propaganda back in 1979, the invented "Palestinian people" and their "legitimate rights" were in full swing. In 1979, the front of dhimmis, those islamochristians such as Hanan Ashrawi, were already in evidence — on campuses, before church groups, disguising the nature of the Jihad against Israel which cannot be assuaged, cannot be sated, and is not a matter of borders. But something has changed: other Muslim attacks, in America, in Russia, in Europe, and other Muslim cries against Infidels, and other Muslim behavior, including the demand that European peoples yield to Muslim demands, have caused many, and should cause many more, to read the words written above with a new understanding and a new appreciation. Hoist by his own petard was Edward Said — he bothered to quote just a bit too much. Nowadays we do not scorn those he assumed we would scorn, but see the truth of their remarks, and the scorn of the good and intelligent reader is reserved for Said's own text. Quite something. Thoughts of a racist, imperislist, ethocentric European. Said's best-known sentence? -- "Since the time of Homer every European, in what he could say about the Orient, was a racist, an imperialist, and almost totally ethnocentric." Islam, with its roots in Arabic culture, centered around the Arabic language, intolerant of all other creeds and transparently bent on 'global jihad', has been described as a vehicle for Arab supremacism. Now, if THAT is not 'racist, imperialist and totally ethnocentric', I will eat my hat. As I've said before on another site, the main thing that seems to characterise Muslims is the phenomenon of 'psychological projection', that is, projecting their own psyches onto others whilst apparently oblivious to the fact that that they are doing it. You could call it the ultimate hypocrisy, and the fact that they're ignorant of doing so suggests an unacceptable level of bigotry that has been fostered by the conceited dismissive arrogance clearly inherent in the philosophy they follow. (Yet they regularly accuse those who disagree with them of bigotry -- thus proving my point!). And this 'Islamophobia' thing; I wonder how many people actually 'fear' Islam? Rather, since Islam represents the very antithesis of the Western democratic tradition, most of us in this part of the world -- having had to learn what Islam is all about -- loathe and detest it. You do not 'fear' that which you find ridiculous when it is not just plain repulsive.